- Crowns and tiaras can lend an air of elegance to any occasion, but if they are ill-fitting, or too heavy, they can be (quite literally!) a massive headache. 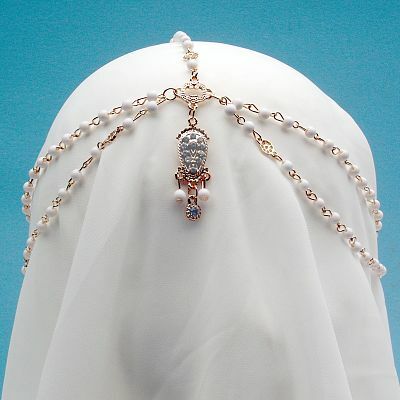 This exquisite headpiece is an ideal alternative. 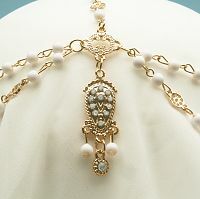 The bead-and-chain construction weighs next to nothing, and has an open and airy structure that conforms to the shape and size of your head. You may even forget you have it on, except for the admiring glances from those around you. 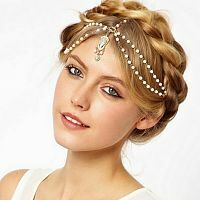 The Ivory-Beaded Headpiece is reminiscent of an Indian tikka or dauni - part of the traditional jewelry worn by the bride on her wedding day. There's no need to save it for that special day though. This bright and breezy style looks great on any occasion- from proms and parties to festivals and faires. 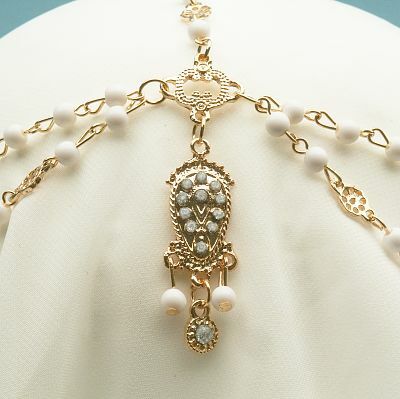 Are those beads really made from ivory? Oh gosh no! Ivory describes the color, not the material. Real ivory is lovely, but it looks best on elephants, not humans. What is the diameter of the headband? It is adjustable between 22"-24". Can I use this to hold a veil in place? The headpiece really is very lightweight. There's not a lot of mass to hold a veil in place, so you will probably need to add a few bobby pins to hold it securely. Do you have any other questions about our Ivory Beaded Headpiece?